I’m talking productivity here. The question is… Is digital actually better or worse for brainstorming, organising, and planning your thoughts into actionable processes? As technology abounds in today’s society and everyone is using word processors, spreadsheets, mind maps, and slide presentations to communicate ideas, it’s not a matter of choice anymore. Digital is it, but is it really the most effective way to explore your own thoughts and achieve the highest productivity out of your own time. I don’t know about you but I keep a simple notebook on my desk to write down a list of tasks that I want to achieve every day. It’s a great way to keep focused and I’ve been doing it for a few years now, so it’s something that I’ve developed into a habit and find it very useful. 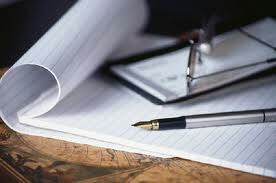 I find writing with a pen is much more intuitive and thought provoking than typing on a keyboard. I guess because it’s a little more creative, a little faster, and it produces a greater mind-body connection. The problem is that you can’t just copy and paste that text, format it, and transfer it to another application. Of course there are various new hardware devices like the Livescribe pen making this idea more of a reality today, but that is topic for another post. Today I did something a little different than just writing tasks in my notebook. I decided to write down everything I was thinking. I would be half way through writing a list of action steps and then I would hit a step that would spur a new thought process. Instead of trying to keep focused on the bigger picture and bury those new thoughts, I wrote them down and continued that thought process until it was resolved. I found this actually helped me to work through a lot of things that my brain would usually not be able to focus on, either because the thought was too large and I needed to break it into smaller chunks or because it might be an area that my subconscious was avoiding. That is also topic for another post but I found instead of letting my mind go cloudy, I would write questions to myself, and then I would answer them. Once I had answered or eliminated all my objections, I was able to return back to my action step list and proceed. In just half a day I had already written 10 pages of scribble, which is something not really worth doing in digital form, or something that you wouldn’t bother doing in digital form because it’s all about concise, to the point text, and reducing the number of words needed to express an idea. Creating digital content definitely has it’s advantages as you can easily segment content, add new content to previous sections, and create a document that’s easy to share with others, but if you are stuck on a idea and can’t seem to work out the steps you need to take to make it happen then definitely try just writing in a notepad. It’s a great way to establish that mind-body connection and really explore your deepest thoughts and objections that may be holding you back from achieving your goals. Even though it can take longer to write every thought out on paper, and then rewrite some of that content into digital form, you might just find that your actual productivity level shoots through the roof.